We are jumping with joy to have added another fantastic male to our breeding program. 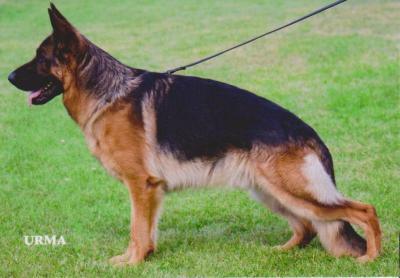 Our first male Lars vom Frankengold came from a top kennel in Berlin, Germany. We have kept many super Lars daughters. We went back to the Frankengold kennel to get another fantastic male to breed to our Lars daughters. The mother line on Geronimo is VERY strong and has produced MANY top dogs. We are thrilled to double up on it in our kennel. Many thanks to Mr. Goldlust who is a top German judge for allowing us to add Gero to our breeding program. We are thrilled to have an exceptional male with EXCELLENT structure and OUTSTANDING temperament. His first US litters are due in November 2014.